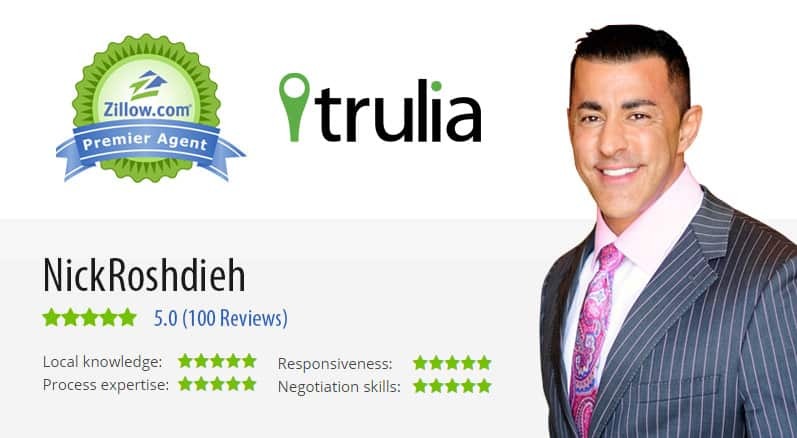 Nick Roshdieh is proud to be a Zillow and Trulia Premier Agent with 100+ 5 star reviews. We have worked with Nick for the past 10+ years. He helped us purchase our first home and ever since then we have come to Nick for all of our real estate needs. He not only goes above and beyond to make sure the process of home buying is a smooth transition but he also keeps you informed and in the loop every step of the way. Nick is a true professional and a power negotiator. He not only is our real estate agent but has become a great friend. Thank you Nick for always treating us like family and putting our best interest before anything else. Nick and Julie are amazing. I was so impressed by their efforts that I referred my father to them to help them. There is no better compliment. I would use them every time and anytime. And actually I plan on using them soon as we are looking for a bigger home! Nick and Julie sold our house very quickly and for top dollar. We were actually in Europe when everything happened – they worked with us in a different time zone and got all documents over for electronic signatures in a timely manner. What could have been an extremely stressful experience ended up being very fast and seamless. Nick was a professional throughout the whole process of selling our home. Our home sold quickly and without any issues, because Nick properly priced the home, prepared us and our home. Then selected the right buyers. We will definitely seek out his advice and services in the future. We have worked with a number of agents over the years — no one comes close to Nick Roshdieh and his amazing team. We chose Nick from a postcard he sent and from the moment he sat down with us to do a presentation, we knew he was the right agent to sell our home. His entire outlook on life matches ours, and that was important — to have an agent on the same wavelength is really the key to having the best sales journey and outcome. Nick listed and sold our home in record time. He also got the us the price he said he would and we were happy with. Our house was on the market less than a week. When it came time to finding and buying a new home, we worked closely with Julie, a stellar agent on Nick’s team. Julie is a pro who’s always happy to be doing what she’s doing, and she is always on her A-game. She is super organized, efficient, responsive, expertly knowledgeable and negotiated a price for the house that we were happy with. Nick and Julie will be the ONLY agents we work with again in the future as they are the best in the biz. Thank you Nick and Julie for making the chaotic process of buying and selling homes a more pleasant journey. Nick took great care of EVERYTHING throughout the whole process of selling my moms house with a caring, understanding, professional attitude. Any situation that came up his response was “I’ll take care of it”, and he did!!!!!! Definitely will use his expertise in the field again. Nick not only sold my house in 2 days but was able to get over asking price which was well above the comps for the neighborhood. The process was very smooth and easy for me as the seller as Nick and his team handled all the details. I would highly recommend Nick to anyone looking to buy or sell. I am very happy I made the decision to put my trust in him to sell my home. Nick was extremely professional and responsive to all our needs. He went beyond our expectations to make sure he met our goals. Our home was a rental and we live out of the area. Nick took care of everything for us and worked together with our tenant to make sure the property was always ready, he held many open houses, and he took care of all details related to the close and final inspections, etc. We are completely satisfied and know he did everything possible to make this a good experience. Awesome OC realtor. Our transaction was done fast and very smoothly. Nick helped sell our home at our first open house and before we realized, we were done. Nick and his team is very professional, knowledgeable and thorough. I highly recommend them and wish them the best. excellent agent. would work with him again. really helped us through the sale. all the way from getting the property ready for sale through the open houses, and negotiating with the other agent. Nick worked in our best interest. Nick and his group did a terrific job for me with regard to the sale of my home! He is top notch! His professionalism and attention to detail of every part of the transaction made an easy stress free sale. Nick was an OUTSTANDING realtor overall. We sold our house and bought a new house with Nick and his team and they made both situations extremely easy. He dealt with all of the details at all times and all we had to do was basically show up for various signature approvals. He got us a great price for the house we sold and a great price for the new house we bought and he carefully walked us through every single detail without any real problems whatsoever…. And even after both sales he made sure that things went well months after the move, that kind of service is almost impossible to find unless you work with Nick and his team…. Nick made every effort to sell our home and did amazing job. We feel we where in safe hands with Nick at the wheel. He is smart and and a top real estate agent who you can trust to get the job done. Nick is a true consummate professional. From the first time he did a market analysis of our home, he knew the precise amount that our home would sell for – and it did! Not only was Nick able to get us the amount our home was worth, but his negotiation skills were superb. We received a few low offers and Nick negotiated on our behalf and ended up selling our home for $427/sq. ft when the average in our neighborhood was only $380/sq. ft.
We are extremely happy with Nick and his team, and would certainly use him again for any future real estate needs, as well as refer him to our friends and family. Nick is a consumate professional. All aspects for the sale were performed top notch. At a time while emotions and nerves ran high, Nick maintained a calm, professional approach. Nick also helped to get us a record high price for our area of Laguna Beach! Nick was highly recommended to me by a friend and after reviewing his website I moved forward with him and Sotheby’s International Realty to help me sell my current home and look for my new home. Nick has extensive knowledge about the real estate market in Southern Orange County California and that was a big help in my home purchase. His hands on approach and knowledge also made the difficult loan process much easier than expected. Nick is always responsive and goes way beyond the call of duty for his clients. He sold my house, helped me buy my dream home and treated me like I was a family member. Nick always had time for my questions and he made me feel like I was his only client. Nick Roshdieh is the ultimate professional and he is highly recommended. Nick and his team excel in their professionalism and knowledge of the market. Navigating through the home market at this time can be overwhelming and Nick takes care of it all for you. He even offers the option to decide the length of your listing period with him. Amazing performance. Amazing customer service. I’m very impressed. After a few years of using what I would best describe as marginal RE agents we found a true gem of a Sales Rep and Organization in Orange County… Nick and his team at Sothebys Laguna Beach. We honestly were getting used to knowing more about the location were looking to buy in than the sales rep, receiving shoddy response time to our questions, and not having a strong negotiater to get the deal done. I can’t say how many homes we lost out on a great home until we met Nick. He found us the home in Laguna Niguel area we love, knew everything about the area schools and home values, and got it at a very solid negotiated price. And he and his Team’s follow up was exemplary and beyond reproach. Suffice it to say we feel that because of Nick we live in the home we always dreamed we would own and can’t say thanks enough. Nick has assisted me on six transactions, and I will definitely call on him for my next. He and his team are knowledgeable, responsive and professional. My wife and I absolutely loved our experience with Nick Roshdieh as our realtor. We were in a bit of a hurry to purchase a house and were also coming from out of state. Nick previewed about 30 homes for us based on a series of questions that he asked us about what we value most in a home. He narrowed our search down to seven houses that all matched what we were specifically looking for. This made our search very easy and we had picked our new home within three days of arriving from out of town. The negotiating process went well as Nick was in contact with the sellers’ agent constantly and he was very good at communicating with us so that we were all on the same page. His excellent communication ranged from phone calls to texts to emails. He was in contact with us every day checking on us and giving us updates. Since the sale closed, Nick has still been in contact with us as a friend and advisor. He is such a great person on top of everything else. We highly recommend working with Nick Roshdieh! Nick has helped me finding and buying a home in Laguna Nigel. I am a first time home buyer in California. Nick was very patient helping me through each step. Nick is very familiar with the area and was able to provide great advice. Nick is always there when I have questions. I am very impressed by his knowledge and professionalism. And I am very lucky to have Nick and his team and his extended network to help me purchase this home. We really enjoyed our time working with Nick. He is very friendly, knowledgeable, and flexible. We had countless phone call and text message exchanges with Nick and he was always super responsive. He was extremely professional and understanding through the entire process. At this point, we’ve worked so closely with him for so long, we actually consider him a good friend.Thanks Nick! I had to sell my homes urgently due to some domestic issues and I was running short of time.But after meeting Mr.Nick Roshdieh my problem was solved in just 15 days and sold at different places Newport Coast,Turtle ridge with amazing prices more than my expectation.He is simply awesome with great skills.Most highly recommended! Thank you very much..
Nick is the best real estator.I met many but none were up to the mark.Nick has got the best knowledge and implemented on our project and we are happy with his work.He sold to us at many places like covenant hills, laguna beach,turtle ridge etc.Remarkable person! Nick and his team were always professional and expertly executed our short sale.Constant communication and his updated knowledge about current market was a sign of relief for me.He stood on his promise and gave many offers with great prices within eight days and finally sold to us at Newport coast.Great job Nick! It was an amazing experience working with Nick.His remarkable knowledge on home sell process made the work quiet simple and sold to us at Laguna Beach within a week with great offers as well.Most trustable and genuine real estator. Great work by him thanks! My husband’s family has used Nick for all of their homes. When it came time to sell our house, there was no question who we were using! Nick and his assistants are knowledgeable, Compassionate and caring about you and your needs. Emails were responded to in a matter of minutes and both were available to answer questions day or night. I would recommend Nick Roshdieh to my family and friends! Nick is an amazing realtor for many reasons!He made the home sell process very quick and efficient.We were lucky enough to have Nick and his expert advice with us every step of the way.Thank you ! Nick was truly great. Very knowledgeable, professional, responsive. We ran into some problems while Home sell process and he was supportive and helpful the whole time. Overall – fantastic realtor! We chose him based on the good reviews he received on Zillow and they were well deserved. He was prompt with all of our correspondence, knew the Covenant Hills area very well, was very patient with us, and ultimately helped us to sell our home easily. He was very thorough at every corner and worked hard for us all the way through the process of price negotiations, and closing etc. The experience was great! My fiance and I met Nick and found a house we loved four days before we were leaving the state/country for about a month over the winter holidays. Nick and his team worked with us every day in person, over the phone, or through email across the country and internationally to help us navigate the entire process at a very fast rate and work was completed within short period of time. We truly appreciate all of Nick’s hard work in helping us with the sale of our home. The exceptional professionalism and personal service provided by him and his team was extraordinary. Nick’s honesty, experience, and intuitive knowledge of the real estate market distinguish him as a rarity amongst agents today. We are grateful and will surely recommend him to our friends and family. Nick is the most professional Real Estate agent that I have ever encountered. His passion is evident from the moment you meet him. Nick was there for us, and took care of everything. He could not have made the experience more stress free. I have recommended Nick to all my friends and family and will continue to do so. I had a wonderful experience with Nick as my real estate agent. Nick’s follow through was excellent, and he navigated me through the sale of my home. He is tenacious, very professional, and hard working.. He is a exceptional negotiator, and represented me well, only keeping my best interest in mind. He is extremely knowledgeable and knows the ins and outs of the real estate business. He helped me make some very difficult decisions. I could always get a hold of him or a member of his staff at anytime. I am so happy that he represented me when I sold my home in Laguna Beach. Anyone who is looking for a new home or needs to sale their home at the fair market price, I would recommend them contacting Nick without any hesitations He is an expert in the area of Covenant Hills, the market and more importantly; your special needs. Nick knows the real estate areas of South Orange County and beyond; in particular Covenant Hills in Ladera Ranch . Nick’s sincerity and integrity showed during the entire time our home was on the market. He listened, answered and solved all of our questions and needs in a prompt/professional manner and was always easy to contact – regardless of the day of the week. Nick has been my Go-To real estate agent in Laguna Beach and has helped me buy and sell several properties. He has an incredible knowledge of the area and an extremely great eye for value, something that is of the utmost importance to me. He is honest, trustworthy, and dependable. He will work hard for you and go far beyond the extra mile. I continue to use Nick’s services as a real estate agent to help me locate and buy homes with great potential as well as helping me get my own primary home ready for sale with all of his complementary services. Nick knows how to strategically negotiate a great price, and is an expert at efficiently marketing a home for sale and are intimately familiar with the nuances involved with successfully closing a real estate transaction. I have 110% confidence in him. Thank you Nick!!! My husband and I have recently sold a property in Laguna Beach through eVantage home team with Nick Roshdieh. He was an absolute pleasure to work with and so professional. We highly recommend using this team. The team works effectively and provides immediate and accurate responses, follow up, and respects your needs and wishes. Utilizing Nick and his team should be part of your real estate strategy. It is a smart business decision in a highly completive marketplace. We wouldn’t use anyone else but Nick. He is not only our Real Estate Agent but has become a friend for life! Nick Roshdieh was very professional in marketing and selling our home in Newport Coast. Within a few days on the MLS it was SOLD. We strongly believe it was his excellent marketing skills, honesty and knowledge of the real estate market that led to the sale of our home at over the asking price! Nick was in constant communication with us, even when he was on a personal trip with his family. He definitely went above and beyond what you expect a Realtor to do for you. We recommend him to all are friends, family and neighbors. He is amazing! Nick Roshdieh has handled multiple transactions for our family, from the sale of our multi-million dollar home in Laguna Beach to the purchase of a townhouse for our daughter in Ladera Ranch. He is very thorough in his processes and follow up, he is a good communicator and very knowledgeable of the market. He is an extremely hard worker and has endless amounts of energy. He is diligent about getting the job done without any hiccups regardless if it is a sale or a listing. I would only use Nick for my real estate needs. I refer him to all my friends and family! Just awesome! Enthusiastic, friendly, expert, go-getter, responsive, passionate, and a clear vision – the first few words that come to my mind as I’m writing my review for Nick.High level professionalism that is unparalleled.He eased my work and I’m very much satisfied with his work.Thanks a bunch ! I think there is no other person like Nick in real state property business. I am grateful to him for his exceptional assistance in selling properties. He easily sold my home on good price within no time. His local knowledge in real state property is unbelievable.I would highly recommend working with him to sell property. Thanks! I was pretty much confused and worried about my home sale,these days its very difficult to find a genuine and skilled professional in this field but to my luck I found Nick who has great knowledge with ethics and lots many! His tremendous skills made my work easier and within short period of time I got many offers.Highly recommended! Great working with you Nick! Thank you! I appreciate Nick Roshdieh’s dedication to selling my home in Turtle Ridge as well as having his buyers team assist in the purchase of my new home in San Clemente. The professionalism that he exhibit’s is beyond reproach. His personal commitment on the selling side of the transaction was unparalleled. Again, thanks and please know that our most heartfelt recommendations go out to any of our friends and associates who are looking for that perfect agent. He not only is on the “top” of the list but is the best. I must say, this was the most efficient and least painful real estate transaction I’ve ever been involved in. I originally purchased my home in Ladera Ranch (with the evantage Home Team). The home was a bank foreclosure and he negotiated a great price! Nearly two years later I enlisted Nick to sell my home. Once listed it took only three hours to receive a fully qualified cash offer. Two weeks later the papers were signed and the house closed. The process was a minor blip in my entire day. I wouldn’t hesitate to recommend Nick in the real estate process! We listed and sold our house with Nick Roshdieh in June 2012 in San Clemente. Nick and his team were able to guide us at every stage of the home selling process. We had several showings within the first 5 days of listing and subsequently had a contract within 2 weeks. We had a lot of moving parts to the home selling due to our being in and out of the country and us moving out of state, and Nick and his team were able to pull everything together with such ease…thank you eVantage Team – it has been a pleasure to work with you! The Arnold family. I have bought and sold seven houses in my lifetime, Nick Roshdieh is by far the tops. This is a realtor who does not rest on his laurels. He had prospects for our home even before it showed up on MLS. Nick is thorough, reliable and ever accessible. He works for the client, and got me a sale in this economy–and in record time for a home on the bay front. I highly recommend Nick Roshdieh in the world of realtors. He came highly rated by some picky friends. They were correct. If you want your place sold, call Nick. We loved working with Nick! He offered great recommendations on pricing and staging our home in Newport Beach. He knew all the right contacts to get our house prepared. He even helped us close the sale when we were out of the country. Nick is the kind of guy you want on your team. Nick is tech savvy and he was quick to respond to all of our inquiries. Being prolific email/text-ers both my husband and I were very impressed and pleased with Nick’s responsiveness. Nick sold our home in Laguna Beach this past May. Nick, was recommended to us by a close friend and was described as the perfect realtor. This was all true from the very first conversation that we shared. Based off of our conversation he was able to come to our home the very next day. Throughout the entire process of selling our home, he has been very knowledgeable of the market and the value of homes. I would highly recommend Nick to anyone who is looking to sell a home. Nick just finished listing and selling our home in Monarch Beach. We were able to find Nick through Zillow.com. After reading the reviews we need we needed to talk to him in addition to the other realtors we already spoke with. Nick was very honest and sincere. Nick has an amazing listing presentation and honors everything that he said he would do. Nick place our home on the market at market value and before long we had multiple offers to look at. After accepting our offer we closed escrow 30 days later. Nick is definitely that go to realtor for Orange County. We trust Nick and his team to always be honest and hard working. Let me start by saying thank you NICK and TEAM!! Nick had sent an amazing marketing piece to our home. We had our home listed for sale in Feb of this year and took it off the market in April. After seeing the marketing he did for someone else in our area we just knew that we had to talk to him about listing our home for sale. We knew he would go above and beyond. After meeting with Nick and going over his listing presentation we knew he was the right man for the job. He has many different resources that we had not seen before. He has a large network of people and made us feel comfortable that he would bring us offers. Within days of listing our home we were seeing results. We had showings and offers at the same time. Nick and his team did an amazing job and kept us up to date with all information. We had a smooth escrow and overall this experience was painless. We found Nick through this very site. Nick listed our home in Laguna Beach July of this year. Needless to say Nick has sold our home. Nick is very knowledgable, honest and hard working. Nick is a man of his word. He is a great negotator and got us exactly what we wanted. Nick and his staff truly do an amazing job in ALL aspects of the real estate business. We highly recommend you guys! There is no other agent like Nick Roshdieh. His local real estate knowledge is like no one else we have met. Nick listed our home in Coto De Caza. We were not the easiest clients to work with as our expectations are high. Nick sure did deliver. He went above and beyond the call of duty. Once our home was listed Nick and his team did a excellent job of marketing our property. Within days of our home being on the MLS we had a multiple offer situation which Nick helped us navigate and decide on the best offer. Nick was committed to delivering us the best service and it showed every step of the way. We were in escrow 6 days after our home was listed and we closed escrow 33 days later. All we could say was WOW. Nick is honest, hard working, extremely knowledgeable and trust worthy! His personality draws people to him. We highly recommend Nick and his TEAM to anyone. We found Nick Roshdieh through Zillow. We called him and he arranged to come to our home and give us a private consultation. After talking with Nick for 15 minutes we knew that he was the realtor for US. He was very up front and honest with us. Nick listed our home for sale in Newport Coast in July and we closed escrow yesterday. Nick did a great job of marketing our home to the right buyers. Our home was on every real estate website and even was premiered on many. He was present for every showing. Nick communicated with us every step of the way. We have complete faith and trust in Nick and would recommend him to anyone. He is a very trustworthy honest individual. Nick came to us from a reffereal. Nick came to our home and met with us to discuss our options. He is very honest and up front. After meeting with Nick we listed our home for sale in Laguna Beach and 2 days later he came back 2 days later with an over asking price offer. It was amazing!! Nick had us in escrow 3 days later and we closed escrow 30 days later. We were amazed how this process was. His is very extermly professional and it shows in all aspects. Nick is a hard worker and is very truthful which is refreshing for a realtor. Thanks again Nick you were great. We will use your expertise again. I met Nick through a mutual friend that had worked with Nick before. I called Nick to talk to him about selling my home. He offered to come out and talk to me and give me a private consultation. After speaking with Nick and asking all the questions I could I decided to list my home for sell with him. Nick did everything that we said he would do; he did a great job of marketing my home, he was there for every showing, and brought an over asking price offer and answered any of my questions right away. I felt very good about having Nick list and sell my home. The whole process took 41 days from accepting the offer. Nick did a great job and even had someone on his team help me to find a new home. Nick is very honest, friendly, hard working and knows the business. I just closed escrow and moved into my new place. Thank you again for helping Nick. Nick was recommended to us from a friend in the real estate business. Nick came to our home in Newport Coast and presented his listing presentation. It was easy to see that Nick put hard work in his listing presentation and went way above the expected standards. After talking to Nick we decided to list our home. Nick did a great job marketing our home and presenting it to buyers. Our home had an over asking price offer which we accepted. Once we accepted the offer we were in escrow and closed within 40 days. It was great to be able to come away on top in this economy. Nick sold our house for 1.9 million. Thanks Nicks. We met Nick a few years ago at a broker preview so it was natural that we would use him to list our home for sale. Nick is an honest, hard working agent. Nick listed our home in Dana Point for sale in May and one week into the listing Nick called to tell us we had a very generous offer. We looked over the offer with Nick and signed it that day. Nick did a great job of negotiating and working on our behalf. Nick had our home sold 30 days later. Nick and his team did a great job of marketing which included our homes own web page. Nick did an amazing job and has an amazing team that helps him give his clients service that is unmatched. Nick and his team just wrapped up the sale of my home today. Our home was on the market for 2 days before we were told that we had 2 offers on it already, by the weekend we had multiple over asking price offers. Nick came to present the offers and explained to us the best one for us. We signed the offer with Nick and 3 days later we were told we had an agreement. Nick did a great great job of marketing our home on the internet and by mail. Nick did a great job representing us and his team made this a smooth transaction. Nick is very professional, honest, hard working and kind. You know you are in good hands with Nick and that he will do what it takes to get the job done. We found Nick and his team through a referral. Nick came highly recommended. After meeting him we knew that he was the Realtor for us. He is up-front, positive, motivated and honest. Nick had our home in Corona Del Mar in escrow 1 week after putting it on the market. Nick and his team have the best marketing we have seen and we believe that because of this it drew more people to the home. We closed escrow 31 days after accepting the offer. Nick did a great job and brought us top dollar for our property. My wife and I were very nervous about who we should use to short sell our condo in Laguna Niguel after being with another Broker for 6 months without any results. Nick being very professional and great at communicating, assured us that he completed many short sale process with Chase Bank,. Nick is someone we felt we could trust and at the same time was knowledgeable about the market and how it pertains to short sale. He always responded to our questions and concerns promptly which made going through a difficult situation much easier. We would highly recommend him! I met Nick through a referral. He came highly recommended. Nick listed our home in San Clemente in June and was in escrow by mid June. Nick and his team did a great job marketing our home and bringing buyers in. Nick brought many offers. The offer we decided on was over asking price. Nick did a great job of negotiating and closing this deal. Nick has a great spirit about him with a passion for real estate. Nick knows the local market and truly wants the best for his clients. Nick just sold our home in Newport Coast. During a market that is questionable Nick was able to find a buyer for our home within the first 3 weeks of our home being listed. Nick and his team did a great job of marketing our home which we feel drove much of the traffic to our home. Once we had an excepted offer we were in escrow later that same week. Nick had our home closed and we moved 34 days later. Nick is an outstanding agent who knows the market and what it takes to sell a home in this day in age. Nick sold our home in Huntington Beach this past May. We were able to sell our home at over asking price to an all cash buyer that Nick brought to the table. Nick did a great job of marketing our home, it was on every website and he had our home featured on many of the websites which he showed us reports of the websites activity. Nick did a great job and found our buyer within 2 weeks. Nick had us in escrow in 3 weeks and we moved 30 days later. Nick really made this an easy process during what could be a stressful time. We found Nick through a mailer that he sent to us. We called Nick the next day. We scheduled to have him come to our house the next day. When we met Nick he was very prepared. He is very knowledgable about the area and market. Nick showed us his listing presentation and we were in. Later that week Nick had his photographer taking pictures and our home was listed. Nick brought in many over asking price offers, which was great in this market. Nick did a great job of helping to explain which was the better offer to take. Nick and his team did a great job and to top it off Nick has a buyers team which helped us to find a new home in Dana Point. Nick sold our home in Newport Beach in May. Nick and his team went above the call of a realtor. He was very professional and really knew the are. Nick priced our home at a fair market value and after the first weekend Nick called to tell us that he was putting the property on hold do to so many offers. We met with Nick 2 days later and picked the offer we like. Nick walked us through each step and negotiated the best deal for US. Nick had us in escrow that same week and we were moving 40 days later. Nick and his team do a great job marketing, showing you that your important as a client and always looked out for our best interest. Nick is a wonderful agent with a great personality. Nick knows the local market and is very well studied in real estate. Nick helped us sell our home this last year. He had our house the local MLS for 2 weeks at which point Nick presented multiple offers for us to look at, many of which were over asking price. Once we picked the offer we wanted to accept Nick had us in escrow and closed within 45 days. Nick did a great job of marketing our home and has had a great follow through over the past few months. Nick is a very honest realtor. He brings knowledge and experience to the table. Nick and his team helped us with selling our home in Feb. Nick was very upfront with us from the start and followed through with everything that he said. Two weeks after listing our home with Nick he brought us multiple offers to look at and helped us to understand which was the best offer to accept. After a few days we agreed on the terms and Nick had us in escrow. Nick made this an easy and quick process. Nick is a great guy and great agent. He really knows his stuff and would recommend him to anyone. Nick and his team are great at what they do. Nick brings much real estate knowledge to the table and because of this we decided to have Nick and his team sell our home. Nick went over and above the call of an agent. He did a great job of marketing our home and bringing people in. Nick was able to sell our home for a nice profit (which in this market is hard). He did a great job of negotiating the sell and closing the deal. Our home was on the market the week we met Nick and had a signed agreement 3 weeks later. Nick had our escrow closed 34 days later and thanks to Nick and his team they helped us find our new dream home that we moved into 40 days later. Nick is a great real estate agent. He is very honest and upfront. Nick helped short sell our home. During this tough time Nick’s honesty was key. He really painted a clear picture of a short sale and what was going to happen. Nick listed our home and we had an accepted offer 2 weeks later. Due to it being a short sale the whole process took about 3 months. Nick helped us to settle with the banks and even managed to get us money back from our bank. Nick did a great job negotiating with the banks and the HOA. Nick really knows short sells and I am so glad we went with him. I have to start by saying Nick and his team are great. Nick brings a great energy to real estate as well as passion. Nick helped us with the sale of our home in San Juan Capistrano this last March. We met Nick after reading about him online, after our first meeting we decided to have Nick list our home. We knew we could trust him and he had our best interest in mind. After the first weekend of our home being on the market, Nick came to us to present multiple offers. We decided on one that above our asking price and we were in escrow at the beginning of the week. Nick and his team had our home closed 34 days later and we moved. Nick does a great job of marketing. The internet marketing is the best. He also does a great job in communicating with both sides of the transaction. Nick is very trustworthy and did a wonderful job. Nick listed my home this past March. I never thought in this market My home would be sold within 2 months, but Nick had my home listed and multiple offers within 2 weeks. Nick advised me on which offer was best and had us in escrow within 3 weeks. Nick did a great job marketing and getting the word out. He is honest and knows real estate. Nick knows the market and how to navigate through it. Nick and his team helped us with the short sell of our home. This was an emotional decision, but Nick was there to guide us and explain the process to us. Nick had our home listed quickly and within the first two weekends we had an offer that we signed off on. Nick did a great job at making this process not so painful and we came out with our bank giving us money for cooperation. Nick is a great realtor and knows the Aliso Viejo area VERY well. He did a great job pricing our home and marketing it as well. Nick helped sell my home in January. Nick brings great energy and enthusiasm. Nick and his team had my home on the market within days meeting him and over the first weekend he had 4 full price offers on my home. Nick made this process every easy and to my surprise had our home in escrow within 2 weeks. Nick also arranged to have one of his buyer agents help me with the purchase of my new home. Thanks again Nick and Team. Nick did a great job listing my home . Nick is an honest agent with only the best intensions. He had my home in escrow and sold within 3 months. He always took time to keep me in the loop and answer my questions. Nick is very knowledgable and well versed in real estate. I found Nick when I was looking into doing a short sale. He came highly recommended from someone who he had helped as well. From the first time that I spoke with Nick I knew that he was the realtor for me and would help make this process a little easier. From start to finish Nick was always there to answer my questions and lend his support. He always kept me up to date and in the loop. Nick has great negotiation skills and even helped to get some money back from the bank for cooperation. I highly recommend Nick and his team. Nick is a great realtor. He is extremely knowledgeable and brings excellent negotiation skills. Nick and his team did a wonderful job of marketing my home and had it in escrow and sold in a short time (Jan-April). Nick came in at the perfect listing price and brought in multiple full price offers. He was always upfront and honest and always discussed the next steps. We recommend Nick and his team to anyone with real estate needs. Nick is a great realtor. He helped my husband and I with the sale of our home is RSM. Nick had our home on the market in early 2012 and within two months we had our home in escrow and sold shortly after. Nick and his team did an aggressive marketing campaign of our home and we were able to see it all over the internet. He is very informative and kept us up-to-date with everything. Nicks buyer team was able to help us find a wonderful new home at the price we were looking for and with the amenities we wanted. Both Nick and his buyer agent did a great job. I had a great experience using Nick and eVantage to sell my property. Nick took a lot of the pressures off selling my home and allowed me to concentrate on other things such as family and work. Having a real estate professional such as Nick on my side during this process was invaluable. Nick walked me through the process and gave me progress reports each week. This transaction couldn’t have been any easier. I would certainly recommend Nick and eVantage to anyone interesting in selling their home. Nick is a very honest and hard working real estate agent. He helped us sell our home last summer and within 2 weeks of it being on the market he had an offer. We were in escrow shortly there after. We contribute this to his talent and amazing marketing. Nick and his team did a GREAT job for us and we know he will do the same for anyone he works with. Nick and his team were wonderful and handled all of our questions and concerns promptly and professionally. We were very glad to have them help us through this process. Nick is an honest Realtor. He listed and sold our home in Coto De Caza late 2011. During this tough market we thought that it would take quite some time to sell, but to our surprise Nick was able to put our home in escrow within 2 months. The marketing his team did was great and brought a lot of traffic! Nick and his team did a great job with the sale of our home. We were amazed at the amount and quality of marketing his team does. Within hours of our home being listed I was able to see it on every local real estate website. He had our home in escrow within weeks of meeting with him. It was a refreshing experience to meet an agent as honest and sincere as Nick. Nick and his team helped with the Short Sale of my Home is late 2011. I had no idea what to expect, but, to my surprise Nick made this transaction painless. Within the first week on the MLS I had multiple offers on my home. From that point Nick and his team did a great job explaining the process and keeping me up to date with any and all news. I highly recommend Nick and his team for anyone that is going through the hardship of having to short sell a home. Thanks again Nick and team!! Honest, hardworking, dedicated, steadfast, straight forward, realistic, professional, upbeat, optimistic, positive. These are the words that I would use to describe Nick and his team. Nick was successful in helping me short sell my condo after a series of bad buyers and last minute surprises. Even when I started losing hope, Nick kept me going and helped me keep my sanity through the process. Going through this short sale was no walk in the park, but I know that many other agents would have just given up and walked away. Nick not only stuck with it but got the job accomplished. I don’t think you could find another agent with the combination of integrity and dedication to their customer. I highly recommend Nick to anyone for their real estate needs. Nick is a dedicated agent. Nick and his team sold my home in Newport Coast. He brought a refreshing experience to selling. His marketing was great and within weeks had our house in escrow. Nick and his team help sell my house in Ladera Ranch last Fall. Upon meeting Nick I was impressed with how knowledgable he was. He was extremely versed in Real Estate and the needs of us the seller and buyer. Not only did he present us with more then 1 full price offer but, was able to help us find our new home in San Clemente which we love. My wife and I were in a very difficult situation and in danger of having our house foreclosed on. Nick was able to step in right away and get us on track for a short sale. Once on the market, we received multiple offers within a week and began the short sale approval process with the bank. Nick’s “team” dealt with handling all the paperwork and communication with the banks to make it as painless as possible for us. The process does not happen overnight and Nick was incredibly forthcoming and honest every step of the way. Escrow closed this past week and we are forever indebted to Nick for making the transition out of our home as seamless as possible. They did a fantastic job with my shortsale. They promised a sale and they delivered within 60 days. Everyone on the staff was wonderful and helped me with all my questions and fears. I can’t say enough about Nich Roshdieh and his team. They were great at communicating and helping me to understand my short sale. Nick was always professional, polite and answered ALL my questions. Nick and his team really made going through this process much easier. Thank you Nick and short sale team! My husband and I had such a great experience. We felt very confident choosing Nick as our realtor. He really came through and helped us short sale our property. He’s very knowledgeable and made us feel comfortable throughout the process. I would highly recommend him to all of my friends and family. We cannot thank you all enough!!!! When we decided to go the route of having to short sale our home, we did our research and saw how Nick and his team helped so many people who were going through the same thing. We absolutely made the right decision in going with E-Vantage. We know so many people who didn’t know what to do and who fell through the cracks with the failing economy and housing market that were not as lucky as we were to have found someone to help. The process though emotional at times was made to be so easy for us the seller, that we felt very safe and secure. Nick and his team made the process from the paperwork, putting the house on the market, perspective buyers, escrow, and finally someone to find us a home; so EASY!!! We truly mean that! There is no way we would have known what to do without eVantage! All we had to do was follow simple instructions and it all came together. Thank You Nick for having such a great step by step process that works, and for having staff that are so diligent and compassionate as well! We are truly grateful for it all! It is a weight that has been lifted from our shoulders and now to move on and not feel debilitated anymore. Thank You all again ! We have and will continue to recommend you to everyone because there are so many good people out there that deserve to be happy again and worry free! Nick did a successful short sale on my house, on my brother-in-laws house and one of my friends condos getting us all out of stressful situations. I already have referred him and will continue to do so. Strong Realtor with years of experience. We worked for a year with lenders for mortgage relief, only to be denied because of our good credit, income, investment accounts, other real estate owned, and current mortgage payment standing. The banks worked us over and over, especially EMC, so finally we decided our only out was to short sell. We had a major business reason for moving, which justified our decision to sell at such a bad time. We talked to several local agents, and none really had a command of the short sale process, which was a big mystery at the time and frankly, very scary to us in view of our perfect credit standing. Nick came to the house and spent a couple of hours explaining the short sale process, but never advised us to become delinquent. His prognosis for the real estate market convinced us that prices were not going to move up significantly in the next five years. With retirement five years away, we didn’t worry too much about a short term credit decline. In fact, our new landlord wasn’t phased when we presented our pre-short sale credit reports. If the short sale is the only negative on your report, nobody cares. After signing with eVantage, one of our local brokers called and said he was impressed with Nick on another deal he had going in Coto. We listed in May, had a good offer in August and closed in November. Of special note is the courtesy, competence and friendliness of Nick’s staff, namely Lori Gerrity – she’s a real class act. Also, Nick’s negotiators took care of everything, never once requiring us to interface with the banks or any other party. eVantage took care of everything. They really made the experience easy with minimal notary requirement, and internet document signing. We worked with four different realtors and NONE of them compared to the work ethic of Nick. I highly suggest if you have a home to sell that you contact him. It is a tough real estate market in California and we were beginning to lose faith that our home would ever sell, but it did. I have and will continue to refer anyone who wants to sell their home to contact Nick. My wife and I were very nervous about who we should use to short sell our home. Nick being very professional and great at communicating, helped in our comfort level of having to go through the short sale process. Nick is someone we felt we could trust and at the same time was knowledgeable about the market and how it pertains to short sales. We can’t say enough about him. He made going through a difficult situation much easier. We would highly recommend him! My husband and I had our home listed for sale for a few months and unfortunately we did not receive any offers. We decided to interview other agents once our contract expired. We were very impressed with Nick’s professionalism and his marketing materials and decided to use him as our agent. Within 90 days we had several showings and an accepted offer. Throughout the whole process we were updated weekly on the showings and our escrow was very smooth. We couldn’t thank him enough for stepping in and selling our home in this market. We would definitely use him again for our real estate needs. My husband and I met with Nick in July of 2009 to discuss short selling our home. We had purchased a home in 2007 for 650,000 and given the market at the time we were given a loan for too much money and were in financial despair. With two small children and lack of any extra income we felt stuck in this home. We were barely making our payments and the costs of daily living. We had no savings and were living paycheck to paycheck. Our credit was superb, in the 800s and we were never late on our payments. Our overall credit debt was minimal. Our house was depreciating and estimated to be worth more like 450,000 now. Nick was very optimistic that we could sell our home by that October and would even set us up with someone that could recover our credit history in just a few months. Okay we thought, “Sell our home in three months and get our credit back in another three.” He stated he was even short selling his home at the time and made it sound pretty easy. He showed us a letter regarding a similar hardship of a past client. He encouraged us to stop making our mortgage payments and put our house on MLS for sale. After numerous offers we had a match, so we thought. Well it was around October that their company informed us to start looking at rental properties and that our home was in escrow. Papers were signed and escrow started and we found a rental home for our family of four. My husband and I were nervous but relieved we had a stable place to live before the holidays. To our dismay this would be the first of many disappointments. The house fell out of escrow and we were already signed with a lease to move into our rental. eVantage assured us that this was the process and that they were working with the banks to make this happen. I did not know exactly the number but our home ended up with numerous offers, one after another and nothing. Now I know “we are at the mercy of the bank” as one of their associates said but how is it that our home that is expected to sell in three months and now be Foreclosed on after almost two years? Should we have gone with another real estate company? Why did we move out so soon? These were all questions that were on our minds. We knew ultimately this could have been an outcome but why was someone so sure that our home would sell in 3 months and advice us to move out so soon? I can tell you that I did not communicate often with the company and that my husband mainly did but after he instructed them to give us weekly updates. Until the desire of weekly reports we only heard from them every few weeks and were given the idea that everything was being done to its best and their lawyers were even involved on working things out with the banks. This would be the story for the next year and a half. We have only heard from Nick one time since our meeting. That’s right ONE time since the first meeting, not even a call when we went into Foreclosure. Our home is now officially foreclosed and it is May 2011. In my opinion I believe Nick himself should have been in some form of contact with us on a weekly basis not his front office staff with whom is mainly who my husband spoke with. Their company should not have advised us to move out of our home so soon. And Lastly Nick should not have given a family of four with great credit this false hope about our home. I think it goes to show Nick Roshdieh is a salesman. He sure sold us on short selling only to never hear from him again and leave us with poor credit and a Foreclosure on our history. I wonder if Nick ever short sold his home successfully and if so how long did it take him? Did he move out to a rental property while his house sat on the market for 2 almost two years? You wonder. In response to this unfortunate experience, I would like to explain the outcome of this transaction. My team was continually updating this client’s husband, Brian Bozych, regarding the status of their short sale. We document all of our communication and take pride in our outstanding service, leading to frequent referrals. We received several offers shortly after listing this property for sale. Due to uncertainty in the marketplace, I always make sure we have a solid transaction prior to having my clients make any move for their family. At no time did I ask these clients to move out of their home. After postponing the trustee’s sale, we were unable to obtain short sale approval, as the offers did not meet investor requirements. We relayed this information to Mr. Bozych and he was understanding. With the highest closing ratios in Orange County, of which over 350 have been short sales, our success rate is a reflection of our hard work for all our clients, friends and family members.